Alan Jacobs is Distinguished Professor of the Humanities in the Honors Program of Baylor University. Before that, he taught for many years at Wheaton College in Illinois. He writes for publications like The Atlantic, Harper’s, First Things, Books & Culture, the Christian Century, and the Wall Street Journal, and maintains a blog at the New Atlantis. "This may not be the most uncivil political era of all time, Jacobs argues, but there’s something about it that is distinctively terrible . 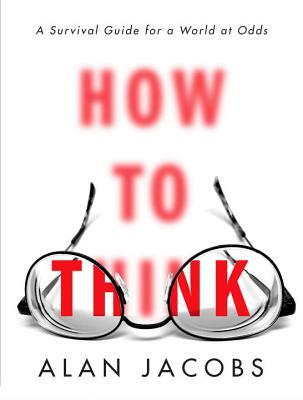 . . How to Think is part essay, part lament, part how-to guide for processing the world more generously." “Refreshing and hopeful, even as it points out some of our worst habits of ‘not thinking’—our tendency toward snap judgment, for instance, or our creation of and animosity toward ‘Repugnant Cultural Others.’ . . . Whatever your positions, this book is a guide in how you should hold those positions, and how you should regard and interact with those of a fundamentally different mind." "Witty, engaging, and ultimately hopeful, Jacobs’s guide is sorely needed in a society where partisanship too often trumps the pursuit of knowledge." "Engrossing and hopeful . . . The compelling beauty of Jacobs’s account of a life lived well and thoughtfully shines through best in his descriptions of the ideal thinker as generous, imaginative, and caring. Unlike the virtues of intellectual self-reliance celebrated by Descartes and Kant, the virtues Jacobs extols are well suited to a world that is beautiful precisely because no one account or model or theory is ever fully adequate to it." "I disagree passionately with Alan Jacobs about a number of very important things, but this indispensable book shows me how to take him by the hand while we argue, rather than the throat. In troublingly stupid times, it offers a toolbox for the restoration of nuance, self-knowledge and cognitive generosity."